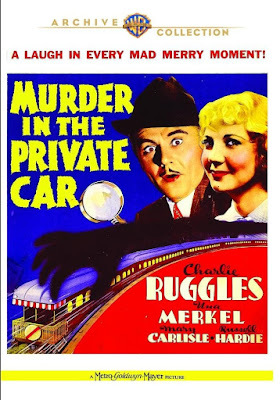 Rupert Pupkin Speaks: Warner Archive - MUDER IN THE PRIVATE CAR on DVD ""
This peppy little mystery comedy is one of those fantastic just-over-an-hour long deals that were being cranked out around this period. I love movies that run anywhere from 60 to 65 minutes, especially the mystery films. 90 minutes is a great length for any movie, but shorter is almost always better. It forces there to be some economy of story and for things to really keep clicking right along. 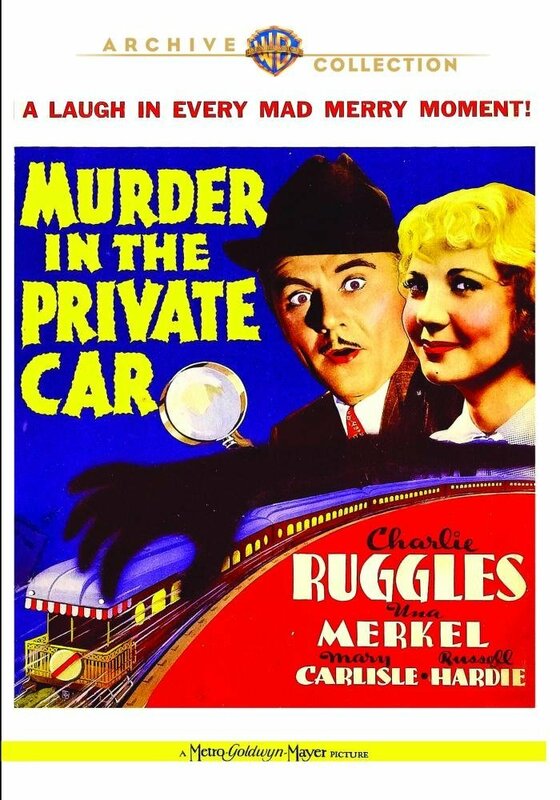 In the case of MURDER IN THE PRIVATE CAR, the title gives some indication as to what your in for. It's basically a whodunit involving a cross country train trip and a newly discovered heiress to one of the biggest fortunes in the world. While it's not quite as good as stuff like The Edna May Oliver mysteries, it's still a fun ride. I love watching old movies for the character actors. Seeing Charlie Ruggles in a movie is certainly pleasing, but even more pleasing to me is when guys like Sterling Holloway show up for a scene or two. Holloway has a voice that is immediately recognizable because he played Winnie the Pooh for a long time. So his voice is quite comforting, but he's also a very interesting looking actor too so he's a pleasure to watch in action. But Holloway isn't even credited in MURDER IN THE PRIVATE CAR and no sooner have we left a scene with him when we move right into one with the great Porter Hall. You remember Porter Hall right? He's one of the studio execs at the beginning of SULLIVAN'S TRAVELS that is listening to John L. Sullivan (Joel McCrea) drone on about his movie OH BROTHER WHERE ART THOUGH. Hall chews on a cigar and delivers Preston Sturges dialogue like nobody's business. But MURDER IN THE PRIVATE CAR has not only those guys, but the leads are all kinda character actors too. You have the aforementioned Charlie Ruggles, who I first saw in Disney's THE PARENT TRAP as the grandfather. I had no awareness of him outside of that movie for a long time, but have been more than pleased to come across his earlier work in the past five years or so. He had a certain mastery of comedic pauses and double takes (both physical and verbal). He reminds me of a Robert Altman character well before there were Altman movies for him to have appeared in. Lastly, there's the always delightful Una Merkel as the best friend to the heiress girl in the movie (Mary Carlisle). Una was also in THE PARENT TRAP and so my memory roots with her go back to that as well. She is one of those actresses that is deeply embedded in the 1930s and 40s movies that Warner Archive puts out. Between 1933 and 1935 alone she made something like 27 movies and that is just one chunk of her enormous filmography. She had a tendency to play the wisecracking, cynical friend in a lot of these movies and she was always right on the mark with her performances. 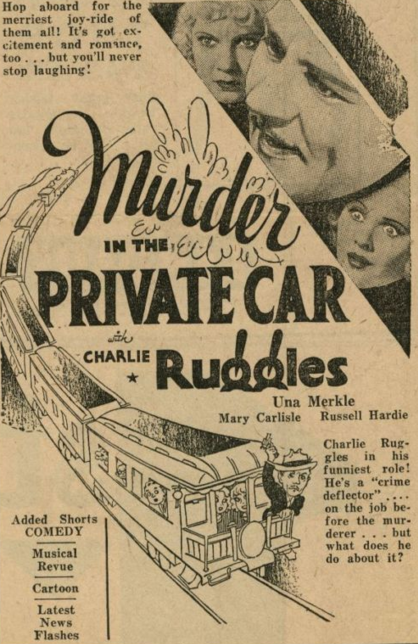 She and Charlie Ruggles both shine brightly and comically in MURDER IN THE PRIVATE CAR.